During your eye exam, your eye doctor might direct a beam of light into your eye, and hold various lenses in front of it. But what does this do? Firstly, this test is a retinoscopy examination, and if you have issues with accurate vision, this is a preliminary way the eye doctor might find out. It sounds fascinating, but by looking at the way light reflects off your retina, your eye doctor can decide whether you are nearsighted, farsighted or have astigmatism. This is how they can also get a pretty good reading on the prescription you would need to correct your vision. 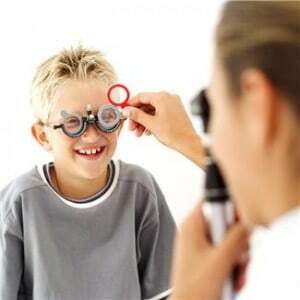 In short, what we are doing during a retinoscopy exam is checking how accurately your eye focuses. We begin the exam by looking for what we call your red reflex. The retinoscope aims a beam of light into your eye, and a red or orange light reflects through your pupil and off your retina. The degree at which the light reflects off your retina, which is what eye care professionals call your focal length, is precisely what lets us know how well your eye can focus. If it becomes clear that you can’t focus well, that’s when we use a set of lenses. We hold up several prescription lenses in front of your eye to see which one fixes your vision. The lens power that works is the prescription you will need to correct your vision with glasses or contact lenses. The retinoscopy exam is performed in a dark room. The patient will usually be instructed to look at something ahead, just behind the doctor. Unlike other eye exams, your doctor won’t ask you to read letters off charts. This means that a retinoscopy exam is also a really useful tool to determine the prescriptions of those who may struggle with speech, like young children and the elderly.